The City of Arts and Sciences generated 111.1 million euros for the Valencian economy and supported 3,461 jobs, according to a study by the Ivie. 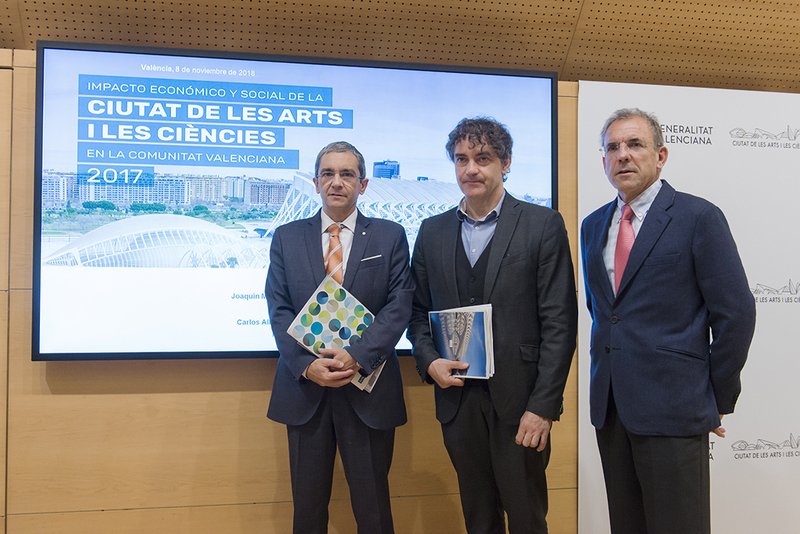 Francesc Colomer, the Valencian Government’s Secretary for Tourism, and Joaquín Maudos, the Ivie’s Research Deputy Director, presented the main findings of the Economic and Social Impact of the City of Arts and Sciences report. According to this report, Valencia’s scientific and cultural complex generated 133.5 million euros of tourist spending in 2017. Spending by tourists at the complex accounted for 120.4 million euros. The other 13.1 million euros was spent by visitors attending acts and events organized at the City of Arts and Sciences. The total tourist spending attributable to the City of Arts and Sciences had an impact on the Valencian economy of 57.4 million euros in income (wages and salaries) and generated the equivalent of 2,401 full-time jobs a year. 53.7 million euros of income and 1,060 jobs came from the ordinary operations of the City of Arts and Sciences (including central services, parking and the Umbracle and Ágora spaces). The sum of both sources of economic impact (tourist spending and ordinary operations) is 111.1 million euros of income and 3,461 jobs. These figures accounted for 0.11% percent of the GVA and 0.17% of employment in the Valencian Community region in 2017. When broken down by buildings, the Hemisfèric generated 8.5 million euros and 302 jobs, while the Museum of the Sciences contributed 20.5 million euros to the Valencian economy and supported 713 jobs for the year. The total annual impact from the Oceanogràfic (including ordinary operations and tourist spending) was 49.5 million euros and 1,704 jobs. As the most popular space in terms of visitors, the Oceanogràfic generated the biggest economic impact for the Valencian economy (45% of the income generated by the City of Arts and Sciences and 49% of the jobs). The bulk of the impact was owing to tourist spending, which brought in 32.5 million euros and supported 1,360 jobs. Lastly, the Palau de les Arts Reina Sofía contributed a total (from operations and tourist spending) of 26.2 million euros and 474 jobs. The report also assessed the social impact of the City of Arts and Sciences as a generator of knowledge, which was estimated at around 60 million euros. This figure was obtained from two alternative measurements. The first is the “willingness-to-pay” of visitors as an estimate of the human capital obtained by a visitor to the City of Arts and Sciences. Using this method, the value of the social capital generated in 2017 was 56 million euros. The second measurement used to estimate human capital is the “cost of equivalent training”, which assesses in monetary terms the time invested by visitors to the City of Arts and Sciences as equivalent hours of training received. According to this measure, the impact on the human capital generated in 2017 was 64.5 million euros.